It takes great faith to believe that everything was created out of nothing. Perhaps like never before, gain a sneak peak behind the life of Eric Ludy in this collection of twenty confessions. 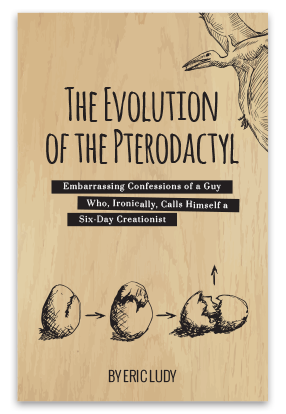 Tracing his life through several hilarious stories from his high school and college years, Eric leads you to the victory, triumph, and sufficiency of Jesus Christ through the retelling of the evolution of the pterodactyl. Far more than a book on evolution or dinosaurs, Eric exposes some simple truths that have the potential to radically change your life. The Evolution of the Pterodactyl is a creative picture of the power of the Gospel—hidden within this laugh-out-loud book is a startlingly clear portrayal of the redemptive power of Jesus Christ. If you’ve ever desired to witness a real-life pterodactyl, here is your golden opportunity.